Ann offers many different classes. Schedule a class for a small group or sign up for an on line webinar. Meeting Your Guides- This is the first step to learn who are your guides, where did they come from and why you have them. Learn the difference between Guides and Angels, ascended Masters and Outer Band Guides. Ann will help you discover your own guides through meditation and personal support. Ann will help you meet your Gate Keeper Guide during this class and you may meet more! Communicating With Your Guides- Now that you meet them, what's next? How do you communicate with them? How do you know it's them talking in your head and not you? This class will help you set up your own personal communication so you can communicate with your Guides and Angels. Ann will help you discover your method of communication so you can strengthen your skills. After this class, you will continue to communicate with your guides on your own, or you can book time with Ann for one on one support if needed. Psychic Development Course- This is design for those who are ready to strengthen there 5 senses on a psychic level. Everyone has the ability, just not everyone wants to take the step. With this course of three classes, you will learn your own strength sense and how to make it stronger. Learn how to see with your third eye, listen with your spiritual ears and feel the energy yourself. Principles of Mediumship- If you want to be a Medium, you must understand the universal principles. Learn how to insure you are personally grounded before becoming spiritually grounded. After taking this class, you will have a clear foundation of what is a Medium how to begin the steps to becoming a Medium. We highly recommend this class for anyone who is interested in the learning more about this world. ﻿Guided Meditation - Do you feel you have difficulty with meditation? Not sure how to meditate? This is the perfect class for you! Learn 3 basic meditation methods that many psychics and mediums use. Discover your own method through this class with Ann's help. Ann will lead the mediation and help you discover your road blocks that get in the way when you meditate. All classes are offered as a webinar and workshop. Webinar is great to start the learning. You need to be able to have computer access. You will be able to ask questions, talk with Ann and others participates during the class. Webinars are offered on Monday and Wednesday evenings. 8:00 until 9:30 EST. Workshop are great if you have a few friends interested in taking a class together. Ann teaches classes on a regular schedule at Rosehill in Monroe NC. Many people request in home workshop. 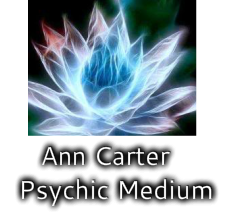 Ann will come to you to lead classes and personal readings. If you are interested in booking a workshop, please contact Ann for more information.